it is not only eek-a-mouse's 6 feet 6 inches height that make him one of jamaica's most individual talents. he has created a style all his own, and gone on to become something of an international phenomenon quite apart from the rest of the world of reggae. hylton's unusual name was originally that of a racehorse upon which he frequently lost money; when the horse finally won a race, he had, of course, refused to back it. "my father's land" and "creation", his first two releases, came out under his real name in the mid-70s. not only were they made while he was still in college, they were produced by his math teacher mr. dehaney. in 1980, he started recording with joe gibbs after working briefly with the papa roots, black ark, gemini, jah life, black scorpio and virgo sound systems. "wah do dem" was the 1980 single that made his name in jamaica. even though it was considered too controversial for radio airplay. it was followed by "modelling queen", another ja hit single that appeared on his first album "bubble up yu hip". both were produced by singer linval thompson and issued on his thompson sound label in jamaica. 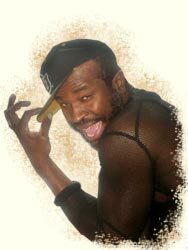 by 1981, he had teamed up with producer and volcano sound owner henry "junjo" lawes and had achieved significant hits with "once a virgin", "modelling queen" and "virgin girl". before the year was out, the artist had joined forces with producer junjo lawes and remixer scientist. backed by the roots radics, eek cut "virgin girl" and "noah's ark", before having another go at "wa-do-dem", for greensleeves. the latter did the trick and eek-a-mouse had arrived with a sound so unlike any other, equal parts singing, djing, and disconcerting oriental-esque weirdness, that soon all of the island was raving about the rodent. he was the toast of reggae sunsplash in 1981, his bubbling lunacy providing a cathartic release to a festival otherwise in mourning for bob marley. "biddy biddy beng" roiled out across the crowd, and the audience shouted it back as one, instantly cementing the syllables as the catchprase of the new decade. eek saw out the year with the holiday hit, "christmas a-come". 1982 was the year of the mouse, with a litter of smash singles including "wild like a tiger", "for hire and removal", "do you remember", and "ganja smuggling", and the seminal album "wa do dem", rounding up most of the hits and more. with "operation eradication", eek proved there was a thinking man inside the mouse costume on a single inspired by the tragic vigilante killing of close friend and fellow dj errol scorcher. a rabid appearance at reggae sunsplash was also captured on tape and released in 1984. "skidip!" appeared before the year closed and although it was less hit-driven than its predecessor, was just as strong nonetheless. more smash singles followed in 1983, while "mouse and the man" proved to be another classic set. again produced by linval thompson and backed by the roots radics, this remains one of the artist's masterpieces. the following year's "mouseketeer", produced by junjo lawes, included several hits, while also taking on contemporary issues and finally answering fans' number one question on "how i got my name". a distribution deal with shanachie later put these records in the hands of american reggae fans. in 1985, eek began working with producers anthony and ronald welch, for whom he recorded the "assassinator" album, which was his u.s. debut on the ras records label. it was a rather depressing and violent affair thematically, although even the most serious subjects have a comic irony under the artist's oddball delivery. surprisingly, or not, eek's international audience was found amongst the rock crowd. which explains why "the king and i", also released that year, was recorded in the u.k. with producer cliff carnegie. but it was on 1988's wittily titled "eek-a-nomics" that the dj began seriously courting this new audience. bolstered by the hit single "the freak", a version of the addams family theme song. eek signed to the island label the following year and even grabbed a role in the film new jack city, playing fat smitty. "i do seven or eight minutes in the movie but they cut me down to one minute and i was pissed. lost my oscar!," mouse laments. he later passed on a part in steven seagal's "marked for death", after reading the script. "it had some bad vibe about jamaicans. it have rastaman doing all kinda voodoo and drugs." the "u-neek" album, which included tracks produced by gussie clarke, daddy-o and matt robinson, was the pinnacle of cross-pollination between reggae and rock, highlighted by a cover of led zeppelin's own hindenberg attempt at reggae, "d'yer maker". the album also spawned the hit single "you're the only one i need", and an appearance on the david letterman show. unfortunately, this was to be eek's first and last album for island. it wasn't until 1996 that a new full-length, "black cowboy", appeared on the sunset blvd./explicit label. though his voice seemed to have dropped an octave, the breadth of subject matter, as well as his patented "bingy-boingy" style indicated that da mouse was still "in the house". mouse continued to tour almost constantly throughout the end of the 90's and into the millenium, performing an amazing 200-250 shows a year. while still finding time to appear on collaborations with different artists including cocoa brovaz, pod, papas culture, mc torch, and branvan3000. also, appearing on various riddim albums from the uk. before releasing "eeksperience" on coach house records in early 2001. a chat with eek-a-mouse is something of an aural adventure. more than a quarter-century of recording, global touring and enough years of residency in the suburbs of irvine to justify an accent heavy on california mall girl-isms have hardly changed the dancehall godfather's husky kingston patois. though his voice is smooth and rich in tone, mouse's unique re-imagining of english grammatical rules can prove challenging to the unprepared ear. take a conversation touching on mouse's feelings about his music's place among reggae's current crop of dancehall favorites. while a couple of decades removed from the early '80s jamaican dancehall scene that solidified his reputation as one of the genre's most irreverent and oft-copied toasters, the mouse - as he is fond of calling himself - hardly feels his career has peaked or that his time has passed. "i'm mouse, you know? i'm mouse, so i can change my style any time. there's different reggae now ... hip-hop, dance, regular reggae. just like eek-a-mouse. i'm also unique, you know? different." "i was singing when i was a child, yeah," said mouse, asked about his hand-to-mouth beginnings in kingston's notorious trench town ghetto. "i would sing with my mama. i was singing all the while. then the kids got interested, and sometimes i would sing them songs. sometimes there would be little concerts going on in school and i would participate in singing, you know? but i knew i was gonna be a singer soon." mouse's diverse list of early musical influences reads like a magic 8-ball of the varied styles that would eventually color his inventive lyricism and instrumentation. "i loved nat king cole, marty robbins, cab calloway, patsy cline ... all different singers. sam cooke and the beatles ... and stuff like that," said mouse, rhapsodically. "and then i came up with my own original style." that "original style" included elements of "sing-jaying," an early form of toasting (boastful catch phrases, singing and dj work) mixed with funky vocal gymnastics and effects. mouse's contribution to the genre was a percussive, nasally vocal style, and a talent for using his voice as a musical instrument that moved the boston globe to call him "the al jarreau of reggae." much to his chagrin, mouse has also often been called the originator of "sing-jaying." "i don't know why they call me that," said mouse, chuckling. "maybe ... it's a good vibe. maybe a good vibe is what they feel, you know? using my voice as an instrument ... (it's) just what i do, you know? "sometimes, if i'm freestyling lyrics ... i'm thinking about the sound. i say, 'bam-ding-ding' and stuff like that to get the lyrics together." over the years, mouse's core audience has also happily accepted his frequent lyrical switch-ups from half-baked humor ("the mouse and the man" is about a disney world meeting of the minds with mickey) and pointed social commentary ("operation eradication" is about the murder of his friend errol scorcher by politically-motivated jamaican eradication squads). "that just came natural," said mouse, of not being pigeon-holed to a sole lyrical style. "i never worried about ... sounding the same because i'm always seeing stuff happen to people. and i'm alive, you know? so i just sing about current stuff happening in the world ... and just make it unique to the mouse." and as evidenced by some off-the-cuff long-distance crooning, what seemed to be on the mouse's mind of late was some serious fascination with amour. "i've got a song called 'pretty girl,'" said mouse, offering a track from this summer's still untitled followup cd to 2001's "eeksperience." he began singing softly and sweetly, "she's a pretty girl. pretty like a diamond. pretty like a-gold." after finishing, mouse shared a few verses from another gently performed love song called "i'll be waiting," this one using all manner of weather-related lyrical metaphors as a promise of keeping one's love real. you in love, mouse? "yeah, you know ... but not really," he said, laughing again. "i go through stuff sometimes, you know? - and i'll sing about it. it's like stress release." we know.